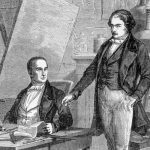 In 1816, a year before the pyreolophore patent ran out, Claude Niépce went to Paris, then to England, trying to make the engine invention work. In the meantime, Nicéphore started by himself some new research on an idea that had obsessed him for many years: making images seen at the back of camerae obscurae permanent by means of a support through a compound. Until then, camerae obscurae — these boxes with a lens adapted on a hole — projecting on the back an inverted image of the outside view, had only been used as a drawing aid. For his first experiments, Nicéphore Niépce positioned at the back of a camera obscura sheets of papers coated with silver salts, known to blacken with daylight. In May 1816, he produced the first image of nature: a view from a window. It was a negative and the image vanished, because in broad daylight the coated paper becomes completely black. He called these images “retinas”. Seeking to obtain positive images, Niépce turned towards compounds that are bleached by light instead of blackened. He then tried with salts and iron oxide, as well as manganese black oxide. Even though he got some results, he stumbled over the fixing problem, which arises when he tried eliminate the initial chemical that had not been transformed by light yet. To solve this problem, Niépce tried to find a method that would make him obtain images etched on a base. To do this, he researched the effects of light on acids in the hope to observe their decomposition. Based on these results, he thought he could simply spread acids on calcareous stones, whose strength would vary with light intensity and etch the stone more or less, according to the hues of the image projected. However, acids are not decomposed by light, so this attempt was yet another failure. Nevertheless, it allowed Niépce to understand that it is not necessary to use a coumpound whose photo-chemical transformation is visible to the naked eye, and that even an invisible change of chemical properties under light action may induce the appearance of an image during a reaction, either with the base or another compound. As a consequence, Niépce got interested by all substances that interact with light. Niépce stopped his studies on light for almost a year. Following a competion started in France, he tried to find deposits of calcareous stones for lithography (limestone). 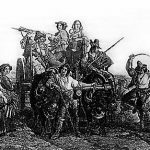 In September 1816, the two Niépce brothers, communicating by mail, tried out a new fuel for their engine. Using kerosene, they discovered the fuel injection principle, as we know it in today’s engines. In March 1817, Niépce decidedly took up his research on making images again. While reading chemistry treatises, he focused his attention on the resin of Gaïacum extracted from a coniferous tree. This yellow resin becomes green when exposed to day-light. What made it particularly interesting is that it loses its solubility in alcohol. Niépce understood that thanks to this property it was easy to see the difference between the modified and the intact resin, thus fix the image. At first he got rather good results experimenting directly with sun-light, but failed when using a camera obscura. He did not know that only U-V rays were active on this resin and that they were filtered by his camera obscura lens. In 1818, next to fixing images, he also developed a keen interest for the dandy horse (ancestor of the bicycle without pedals) and got a lot of attention riding the roads of Saint-Loup-de-Varennes on his “velocipede”. After the Gaïacum resin, Niépce used another resin, consisting of mineral: asphalt or bitumen of Judea. He demonstrated that under light action this resin became non-soluble with his usual solvent. From 1822 on, he succeeded in reproducing drawings put in contact with bitumen coated bases (glass plates, calcareous stones, then copper or tin plates). Afterwards, he used the aqua fortis process to etch the images made with acid, which were then printed on paper. This process was to remain for quite a while the base of photoengraving used to print photos and graphical documents. In order to reproduce drawings, around 1822-1823, Niépce conceived what we now call the contact print. He explains clearly how he applied varnish to the verso of an etching to make the paper translucid, and once dry, he applied this etching directly in contact with the copper or tin plate coated with bitumen varnish. He exposed the lot in full daylight during three to four hours, then rinced the plate in lavender oil diluted with white kerosene. The bitumen that had been protected from the effect of light under the lines of the drawing then dissolved and let appear the raw metal. On the other hand, the light transmitted through the translucid paper had made the bitumen non-soluble and remained on the plate after the lavender oil rinse. The bitumen image was the drawing’s negative: the back is colored in the dark bitumen brown and the lines are represented by the raw metal. Then, Niépce invented a process that would allow to get the drawing etched in the metal. It was by means of the well known and simple principle of aqua fortis. The plate carrying the bitumen of Judea is dipped in an acid bath that bites the metal where it is not protected, meaning the places corresponding to the lines of the drawing. Because the bitumen varnish is acid resistant, the acid can penetrate down to the metal. Once the lines are etched in the plate, Niépce eliminated the bitumen varnish from the metal base to keep only the etched drawing on it. The first successful results of this method can be dated to 1822, as far as contact reproductions are concerned, because this year Niépce made a copy the portrait of Pope Pius VII on a glass plate. This was not yet an acid etched engraving. The earliest attempts of etching in 1823 are not on metal but on lithographic stones. A Dijon-based printer produced paper prints from those stones. Thus, Niépce got the proof that his process — by means of contact reproduction — allowed for the multiplication of originals through printing. In 1825, he etched his images on copper, from 1826 onwards on tin. The acid process is perfectly appropriate to reproductions of line drawings, in which gradations are represented by hatchings. In the case of images with continuous tones, these are reproduced by various thicknesses of bitumen that acid etching cannot render, as the acid solution cannot permeate the varnish. Niépce understood this phenomenon and worked continuously to reproduce etchings. Many museums throughout the world preserve metal plates etched by the inventor with this process. The Niépce Museum owns ten of those metal plates on which Nicéphore reproduced engravings. Other Niépce etched metal plates are preserved at “La Societe française de Photographie”, at “The Royal Photographic Society” or in Janine Niépce’s collection. Yet, after his numerous failures to etch continuous tones images obtained with a camera obscura, Niépce gradually gave up acid etching and stopped completely after July 1827.
n 1824, he put lithographic stones, coated with bitumen, at the back of a camera obscura and obtained for the first time ever a fixed image of a landscape. This required an extremely long exposure time, in broad daylight, for a few days. Starting in 1825, he regularly used copper as a base, then tin in 1826, while also realising etched images. In 1827, Niépce went to England, where he found his brother dying, without any improvements to the engine at hand. He realised then that they would never get any profit from this invention into which they had invested so much hope. After having vainly tried to get the attention of the Royal Society as to his reproduction process of images, called heliography, Niépce returned to France and relentlessly worked on improving his invention. 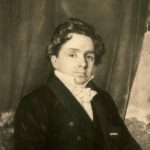 In 1828, he found a new method that led to superior quality images with half-tones. Using polished silver as a base and letting iodine vapours interact with the bitumen image, he obtained genuine photographs in black and white on a metal plate. The preciseness of these images was amazing for the time. The exposure time was still many days in broad sunlight. The photosensitive agent is bitumen of Judea, which is a sort of natural tar known from ancient times. People in antiquity used to collect it from the Dead Sea surface (in the Greek Asphaltite lake), where it kept surfacing continually from the bottom of the sea. It was used by the Egyptians to embalm mummies, to caulk ships or even to make terrace works in Babylon. In the 19th century, people already knew how to extract this tar from bituminous rocks, and as a matter of fact the bitumen used by Niépce did not come from Judea anymore. 1 – Niépce dissolved powdered bitumen of Judea in lavender oil. 2 – Then, he spread this solution in a very thin layer on a base (glass, stone, copper, tin or silver). 3 – With a hot drying process, he got a shiny varnish with a cherry red color. 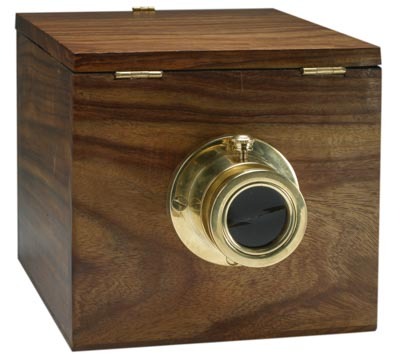 4 – He would then expose the varnished plate in a camera obscura (here via a slide projection). 5 – After exposure, there was no visible image. Niépce would dip the plate in a diluted lavender oil bath that would dissolve the bitumen parts that had not been exposed (or only very little) to light. 6 – The resulting image, seen with a normal incidence, was negative. The exposure time in a camera obscura was quite a few days in broad sunlight. 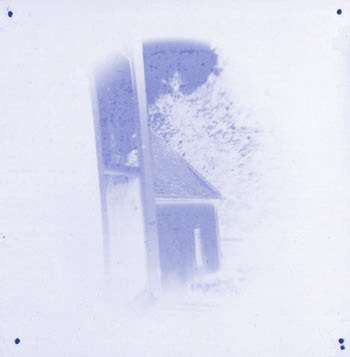 1 – To get a positive image, Niépce used the negative in two ways: from 1827 onwards, without any further processing, under the condition that the image was made with an extremely thin layer of varnish with a slight underexposure. In this case the varnish was mat and by reflection, with a low angled light and in a dark place, the image would appear as a positive. 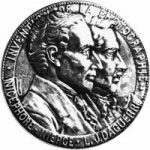 2 – From 1828 to 1831, by submitting the silver plate to iodine vapors to get a positive, Niépce would place it in a box with iodine crystals that evaporated spontaneously. 3 – Within a few minutes the iodine fumes oxydized the silver insufficiently protected by the varnish. This created a layer of silver iodide on the metal surface, which once the varnish was eliminated, would blacken under the action of light. 4 – Niépce would then get a positive image.